Of the many investments that you can make in your home, bathrooms, bedrooms, living rooms, etc. thoughts often turn towards the kitchen. With a wide variety of ideas for installing new flooring, cabinets, appliances; perhaps one of the most difficult decisions to make is what to do with the kitchen counter tops. With a wide variety of options including the use of ceramic tiles or other options like laminates, butcher block, stainless steel, or perhaps going with stone counter tops, there are many decisions that need to be made that encompass the areas of cost, style, and durability. Fitting nicely into all three of these categories is the use of ceramic tiles for finishing your kitchen counter tops. Unlike the other alternatives, ceramic tiles offer the potential for making a very unique decorative statement that just is not possible with laminates, butcher block, stainless steel, or stone products. Stainless steel, well, it looks like stainless steel, not much of an opportunity to make a real design statement there, and many think that this product gives a kitchen an institutional look. Laminates can be picked from a broad selection of designs, but you are pretty much stuck with that one pattern throughout the whole kitchen. Butcher block counter tops, although beautiful at the start are difficult to maintain that way. And stone? 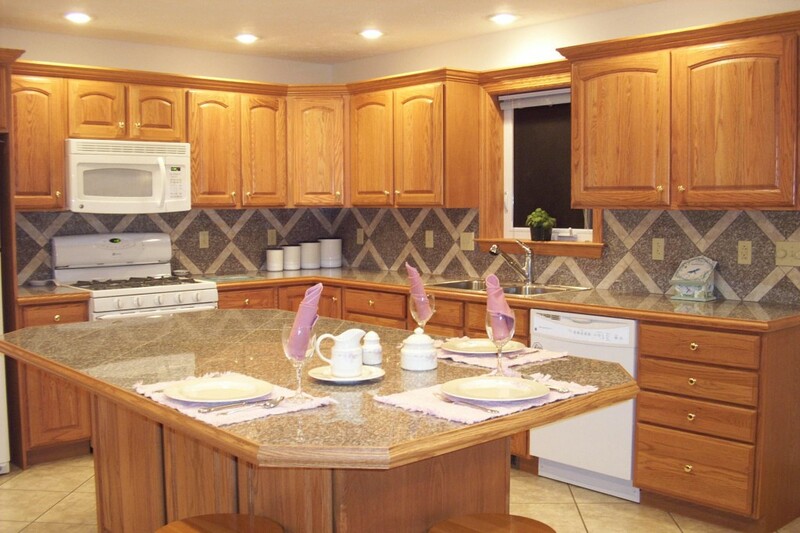 Although very attractive and durable the cost of stone counter tops is prohibitive to most on a tight budget. Ceramic tile is the one product that offers the durability of stone, the ability to create unique designs, and affordability. Ceramic tiles, available in a wide variety of colors, textures, shapes, and sizes offer a very unusual design opportunity for the very creative or the artistically inclined. With the ability to do more than just create countertops with linear design’s, ceramic tiles can be used to create squares, triangles, circles, almost any shape that the mind can imagine. Some homeowners have been known to create elaborate mosaics on their kitchen counter tops making them one of a kind and the envy of many of their friends and family. Ceramic tiles, able to hold up to extreme temperatures, being exceptionally stain resistant and very hard to scratch, are a wonderful choice for the most used area of the kitchen. Subject to the heaviest traffic in the kitchen from making sandwiches to preparing five course meals for that special dinner party, your kitchen counter tops see action morning, noon, and night. When selecting ceramic tile as the material for your counter tops, care should be taken to make sure that acrylic or epoxy grout is used in the installation to avoid any potential staining of the grout holding the tiles in place.